Inertia was best explained by Sir Isaac Newton in his first law of motion. Basically, the law of motion is that an object at rest stays at rest and an object continues in motion until an external force acts on it. One's body movement to the side when a car makes a sharp turn. Tightening of seat belts in a car when it stops quickly. A ball rolling down a hill will continue to roll unless friction or another force stops it. Men in space find it more difficult to stop moving because of a lack of gravity acting against them. If pulled quickly, a tablecloth can be removed from underneath of dishes. The dishes have the tendency to remain still as long as the friction from the movement of the tablecloth is not too great. When playing football, a player is tackled and his head hits the ground. The impact stops his skull, but his brain continues to move and hit the inside of his skull. His brain is showing inertia. If one drove a car directly into a brick wall, the car would stop because of the force exerted upon it by the wall. However, the driver requires a force to stop his body from moving, such as a seatbelt, otherwise inertia will cause his body to continue moving at the original speed until his body is acted upon by some force. Hovercraft are vehicles that can be a challenge to manipulate because, unlike cars, they do not have the same level of friction, so inertia causes the Hovercraft to want to continue in its same direction without stopping or turning. Abruptly stopping a cart with an object on top causes the object on top to fall off. Inertia causes this by making the object want to continue moving in the direction that it was. If a stopped car is hit by a moving car from behind, the passengers inside may experience whiplash as a result of the body moving forward but the head lagging behind. The head is experiencing inertia. If a car is moving forward it will continue to move forward unless friction or the brakes interfere with its movement. When a baseball is thrown it will continue to move forward until acted upon by gravity. The greater the force of the throw, the harder it is for gravity to act upon it. A hockey puck will continue to slide across ice until acted upon by an outside force. A balloon in a car will appear to move when the car moves forward, but the balloon is actually attempting to stay in the place it was, it is only the car that is moving. If an index card is placed on top of a glass with a penny on top of it, the index card can be quickly removed while the penny falls straight into the glass, as the penny is demonstrating inertia. If you jump from a car of bus that is moving, your body is still moving in the direction of the vehicle. When your feet hit the ground, the grounds act on your feet and they stop moving. You will fall because the upper part of your body didn't stop and you will fall in the direction you were moving. When you stir coffee or tea and stop, the swirling motion continues due to inertia. Objects that establish orbit around the earth, like satellites, continue on their trajectory due to inertia. Inertia of rest is an object staying where it is placed and it will stay there until you or something else moves it. If you throw a rock straight up, it will not vary from its direction. This is an example of inertia of direction. Inertia enables ice skaters to glide on the ice in a straight line. If the wind is blowing, a tree's branches are moving. A piece of ripe fruit that falls from the tree will fall in the direction the wind is moving because of inertia. 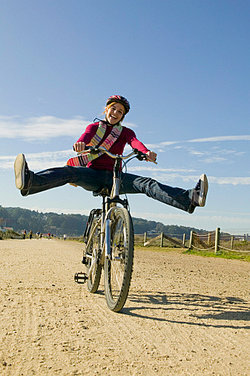 When peddling a bicycle, if you stop pedaling, the bike continues going until friction or gravity slows it down. When pulling a Band-Aid off, it is better to pull it fast. Your skin will remain at rest due to inertia and the force pulls the Band-Aid off. If a ball is on a slanted surface and you let go, gravity will make it roll down the slope. It has inertia and if there is a level area at the bottom of the slope, it will continue moving. When entering a building through a rotating door, inertia will allow the door to hit you in the back if you don't get out of the way. If you are rolling a cart with something on top and you hit something that makes the cart stop, what is on top may fall off. It is harder to stop a big vehicle, like a bus, than a smaller vehicle, like a motorcycle. There is more inertia with the bigger object. A concussion occurs because your brain is still moving while the outside skull is stopped. This is what causes the injury. Space probes are launched to get past the Earth's atmosphere. Then they coast due to inertia. If you are on a train and the train is moving at a constant speed, a toy tossed into the air will go straight up and then come down. This is because the toy has inertia like the train and you. See if you can recognize inertia when it occurs over the course of your day. "Examples of Inertia." YourDictionary, n.d. Web. 23 April 2019. <https://examples.yourdictionary.com/examples-of-inertia.html>.